Out of the West came a real eye Popper! A Snake Hide seat and a fancy gun rack. 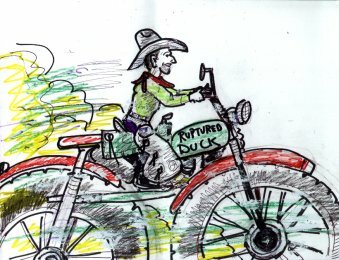 The paint on the tank said "Ruptured Duck!" Then swerved to the left to miss a Bus! Their Ninjas smooth and very fast! He had a crush on "Biker Belle!" but Grandpa Bates had another plan..
And down the side we saw him go. Crossing the ravine and going for broke. The ride of your life, not for the weak! Like a four wheel drive, but it's only got two! basking in the sun like an old horned toad! As Legends go, this was quite a Whopper! Bell and Grandpa and the Texas Chopper.